Selling your vehicle can be a hassle. Here at Smart Toyota of Quad Cities we not only sell vehicles at some of the lowest prices in the Quad Cities, but we also are in the car buying business. 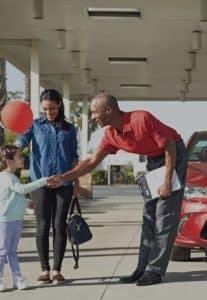 Let Smart Toyota make the car selling process quick, seamless, and help you to walk away with the most money possible without having to negotiate with a private buyer. Schedule an appointment to have your used car appraised by one of our knowledgeable consultants and allow us to earn you the maximum amount for your old ride without feeling pressured to buy or lease a new vehicle with us. Our goal is to simply help you get as much back for you vehicle as possible, Visit us today at Smart Toyota of Quad Cities! Valid state-issued photo ID for all title holders. By submitting this form you agree to be contacted by a Smart Toyota of Quad Cities staff member.